Because English is the language of instruction in both the UK and the US education systems, it is widely assumed that the two systems are similar to each other. In reality, they are quite different, says Elizabeth Sawyer of Bennett Schoolplacement Worldwide. In the UK (England, Wales, Scotland, and Northern Ireland), England, Wales, and Northern Ireland follow the National Curriculum, with some differences. Scotland, however, has its own system and will not be covered here. 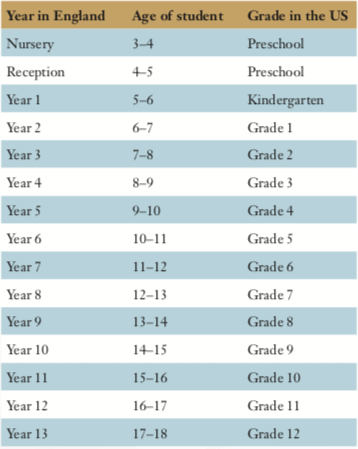 In the UK, children generally begin some formalised schooling at age four, earlier than they do in the US, and with a greater early focus on academics. With key-stage examinations and, eventually, the two-year GCSE programme, starting at age 14, followed by the two-year A Level programme, starting at age 16, the system leads students towards increased specialisation and can be interpreted as a 'winnowing' system. In contrast, the US system places less emphasis on examinations, and students remain generalists all the way through to the end of secondary school, when they graduate with a high-school diploma at the end of Grade 12, the equivalent of Year 13 in the UK.In the US, most children attend some kind of part-time preschool, but state-provided education does not begin until Kindergarten (Year 1 in the UK), and, in many school districts, Kindergarten is still a part-time offering. In the early years, children are eased into academic studies, and there is a heavy emphasis on socialisation as well as developing basic English and maths skills. Indeed, it is generally agreed that, from Kindergarten to Grade 3, children are given an academic foundation that will be applied and developed more rigorously during Grade 4. The US system is typically divided into three levels or schools: elementary (Grades K–5), middle (Grades 6–8) and high (Grades 9–12).Some districts vary this, occasionally including Grade 6 in the elementary level and offering a junior high school for Grade 7 and Grade 8, for example.Some districts may separate Kindergarten from the rest of the elementary school. Generally, however, the three divisions are acknowledged in the different configurations offered by districts. How does US curriculum content differ from that of the UK? In its content, the US curriculum is typically quite broad, and students are expected to study a range of subjects – English, math, sciences, foreign languages, history, art, music and physical education – all the way to Grade 12. In the final two years of high school, students will typically have room in their schedules to take more than the required number of courses in areas that particularly interest them.They are assessed at the end of each grade as they move to the next, but the examinations used for these assessments are not national and have traditionally had relatively little bearing on their progression from year to year; they may contribute to the determination of which level of a course a student may take the following year and whether it would be at the most advanced or less advanced level. There are no exams comparable to GCSEs or A Levels.A notable difference for relocating students at secondary level is that the strands of maths and science are taught sequentially, instead of simultaneously, in the US. A Grade 9 student might study only physics that year, for example, followed by a year of chemistry at Grade 10. Likewise, students progress from algebra to geometry to trigonometry to pre-calculus, and so on. This difference in structure can present challenges to students moving between the two systems, since the material covered in one system during the secondary-school years will not necessarily align with material covered in the other system. At the end of high school, US students apply to college or university (both can be four-year programmes) with a composite of qualifications: their grades of all four years of high school averaged into a GPA (Grade Point Average), results of various optional but benchmarked examinations, teacher recommendations, and a transcript of personal achievements and activities.US institutions of higher learning have traditionally looked for students who are academically accomplished but have something additional to add to their community. In this way, musicians, athletes, and activists have been granted a means by which to describe and showcase their achievements and interests. This has made for a complicated and time-consuming process when students apply to university. Like all systems, it has both strengths and weaknesses. Many students attending university in the US remain generalists throughout their four years of study, after which they receive a Bachelor of Arts or Bachelor of Science degree. Although they choose a 'major', study of this field accounts for only a fraction of their coursework, and they are often required to continue to study across all areas – humanities, sciences, and so on.With the cost of higher education on the rise and becoming increasingly daunting, many students are now opting for more specialised programmes – in business or engineering, for example – so that they can join the workforce with more focused training.Despite the differences in the education systems, it should be noted that it is very common for relocating students to move from one to the other with ease and success. Careful planning is often the key to a smooth transition. This article also appeared in the autumn issue of Relocate magazine.